An extraterrestrial wandered through a Santander town at night. 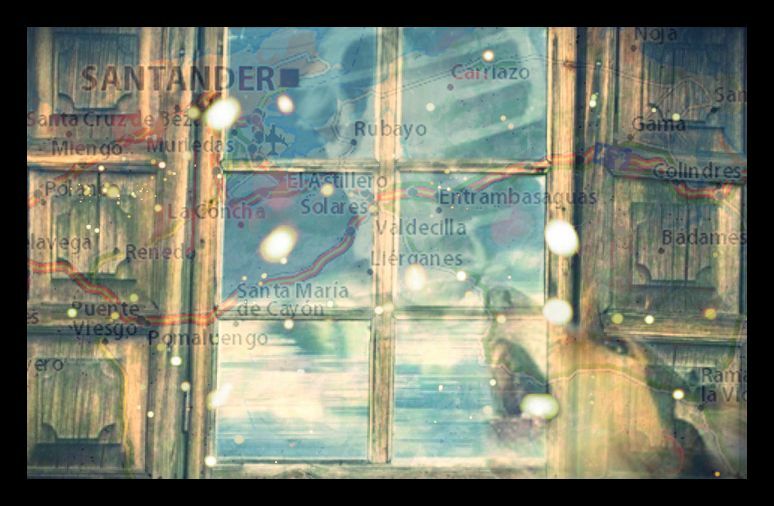 Several local residents witnessed the strange visit by a humanoid to the town of Puente San Miguel in Santander, not long ago the locale for repeated UFO sightings. Upon learning of this, our colleagues German Gonzalez and Jose Ignacio Amurrio headed immediately to this community for an exhaustive investigation that we summarize as follows. On Thursday, December 1, at 5:40 a.m., Mr. Emilio Ruiz Orive, 28, single, a miner by trade, was asleep at his home at 123 in the town of Puente San Miguel. He awoke due to the insistent barking of the two dogs in his household. he was lying face down, facing the door, and he ordered the dog to hush. At that moment, he saw a face similar or equivalent to that of a human being looking through a window with two panes of glass measuring 20 x 30 cm. He wondered for an instant who would be so bold as to peek into a private bedroom. He immediately realized that the face through the window was dark, nearly black, with light colored mustache and hair (white), much brighter than the light to be found outdoors could provide. The witness describes the outside light as fluorescent, in other words, very white. He says the shock was considerable, and acknowledges that fear gripped him in increasing measure as the sighting went on. Seconds after his sighting began, the face - which seemed human to him throughout - pulled away from the window slowly. He was startled by the fact that the face did not dim as it receded. From the perspective he now had, he could tell that the upper body of his strange visitor was covered in a military style tunic (khaki colored, by his own description). He couldn't say if it had buttons or pockets, but did see something surrounding the neckline, with a white strip attached to it, comparable to the plastic collar found on some soldier's uniforms. At a given moment, he saw that the observer looked right and then left, slowly. Now it was only possible to see the area where the alleged humanoid's chest would have been. The witness was unable to recall anything else after that. He doesn't recall when he stopped seeing the entity, if it went off in one direction or another, up or down, or simply faded away. Fear caused him to cover himself with blankets. He only remembers that the light vanished, unable to ascertain whether it was extinguished at that very same moment or shortly after. 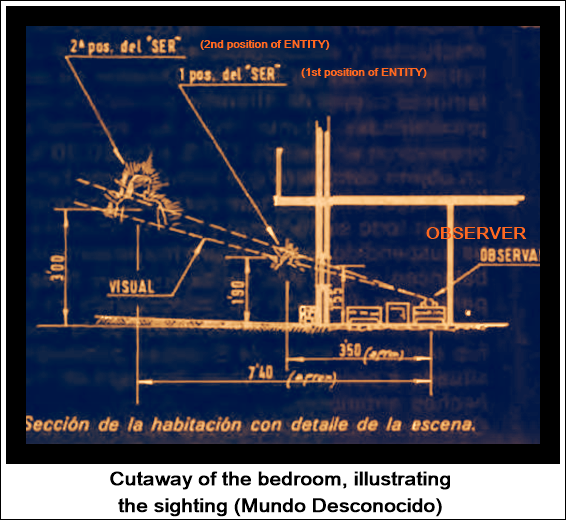 During the course of the observation, which lasted between two to three minutes, Emilio recalls that the window-gazer appeared to increase its size, or else must have been gigantic, estimating its height at between five and six meters (6 to 19 feet), insisting that its shape seemed to be humanoid, while unable to see whether it had any arms. The width was normal (in proportion) with the estimated height. Another sibling, Cristobal, who lives in the same location, was awakened by the barking dogs and decided to get up. He headed for the door to see if there was indeed something outside that could stir up the dogs. He didn't open the door, choosing to open the shutters instead. Through the window, he was able to see that the street was illuminated by a powerful glow coming from the right. He was unable to say if it was near the house or far away, as he couldn't see its source. When Cristobal opened the shutters and saw the glow, he was paralyzed and overcome with fear. He returned to his room without making a single remark after the glow died down. Approximately at the same time, the odd brightness was seen by Mrs. Balbina Noriega as she headed for the restroom. She lives on the floor above the pharmacy visible in the illustration. Mrs. Balbina agrees that she heard the dogs barking furiously, although didn't pay the light much attention, since she thought it was a sign of daybreak. She was startled to see the time when she returned to her room. Another local resident, Mrs. Julia Gutierrez, was awakened by the barking of the dog in her own home. Through the window she could see the bright light, which dimmed after a few seconds, vanishing altogether. This made her think it was a bold of lightning, while no thunderclap was heard, which also surprised here. Her son in law Manuel Fernandez was also awakened by the barking. Also notable are the sightings made by Felipe Méndez de la Torre, director of the famous caves of Altamira. 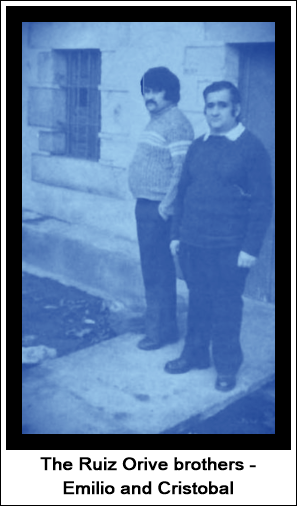 At 20:30 hours in April 1976, De la Torre and his secretary witnessed an object resembling a flattened moon that gave off light throughout, suspended in the sky with a slight balancing movement, and which vanished several minutes later, speeding toward the northeast. This sighting was substantiated by a youth from Suancos, a community located a few kilometers distant from the scene of the previous sighting. Another sighting worth noting occurred in July 1976 in Escalante, some 40 km distant from Santander, an incident during which the dog was a source of fear and confusion, even when it did not see the source of light. There are a series ofe vents in this region that cannot be overlooked due to their significance. A little over two months ago, Mr. Joaquin Cosío, witnessed something he described like the moon, only larger, as he woke up in the early hours of the morning. The object had a whitish-orange hue and gave off enough light to illuminate the surroundings. The balancing motion was highlighted, and it remained in view for five minutes before speeding off to the north. Mr. Cosío's home is a hundred meters distant from the pharmacy, and he calculates the distance to the object observed at approximately one kilometer. Note: The Nueva Dimensión podcast hosted by Juan Gómez (www.ivoox.com) revisited the case in September 2016, interviewing Emilio Ruiz Orive with a view toward clarifying errors and omissions in the case. Ruiz Orive still shudders at the memory of that fateful night. The face, he says, was not black as described in journalistic sources, but rather white and with a long beard and average length grey hair, "more or less like my own," adds the witness. It wasn't looking directly into the room, but rather taking in the surroundings. The incident also had the unfortunate outcome that Ruiz Orive - a miner used to working in the dark - was now unable to face the darkness of his work environment, terrified of it. It took years to overcome this aversion.